Warmer weather is here (hopefully to stay)...the sun is out, the birds are chirping and Emelia is SHOPPING! I have my eye on some new pieces for Spring. I purchased a few dresses last year and really prefer those in the warmer months for the office, since it's easy to throw a light sweater over top if I get cool. The items I found to share today are a variety of casual and office appropriate and most you can wear a variety of ways, which I LOVE! There are affiliate links in this post. This BP Rib Knit Bodysuit is classic, especially for someone who loves layering. You can pair it with a skirt, a cute maxi if you don't want to mess with a strapless bra, some shorts, jeans and a blazer...the options are endless. It has great reviews and BP items always hold up well! Seriously, the price-point and cuteness of these pink and gold sunglasses are amazing! They come in other colors and also so many other shapes if you're looking for something different. I love the pink for Spring! I have one pair of Ray-Bans, but all my other sunnies are cheap because I lose them WAY too easily. These Old Navy swing dresses were on serious repeat last year. I bought 3 colors, and I am LOVING the prints they released. This is such a great basic that you can wear to the office or on a beach vacation-it's so versatile. How fun are these strappy block heels?! The colors are such a pick-me-up and I can see myself wearing these all the time! To be honest, I have a good amount of shoes from Old Navy and they're pretty comfortable. These tie-ankle leggings look beyond comfy with an added detail to make them more than just regular old leggings. You can wear them with a cute tee, or even a tunic and some fun mules would be a great option. I am ALL for this statement Future Is Female tee from Express! I love a cute graphic tee, and this one definitely is a winner. They released a bunch of femme tees to choose from...pair this with a jean jacket for a chic look. Last year I bought a sleeveless knit dress just like this and have absolutely loved wearing it. It's comfortable, breathable and I've paired it with some dressy flip flops and a denim jacket for date night and with a neutral sweater for the office and my favorite lilac sandals for a meeting and always receive compliments when I wear it. I can't rave enough about this brand and dress, a must have! These Universal Thread cognac mules remind me of something my Mom would wear back in the day. I love the color and style and would love these with some black jeans and a tank- so cute! If you weren't already able to tell by how much I've already mentioned in this post, but I LOVE a good jean jacket. My favorite is my Gap moto jean jacket that gets a ton of wear. This white denim jacket is under $20 (a steal!!) and is super cute- I picked it up since I was in need of another Spring coat and can't wait to get it in and wear the heck out of it. I was shocked on the reviews online for these blush slip on shoes! I bought them a few weeks ago and absolutely love them- you can't go wrong with some inexpensive flats with foam inserts in cute colors. I also picked up this leopard pair when I ran to Target for milk last week...ooooops! I can never say no to animal print though ;) I am digging the blue too! 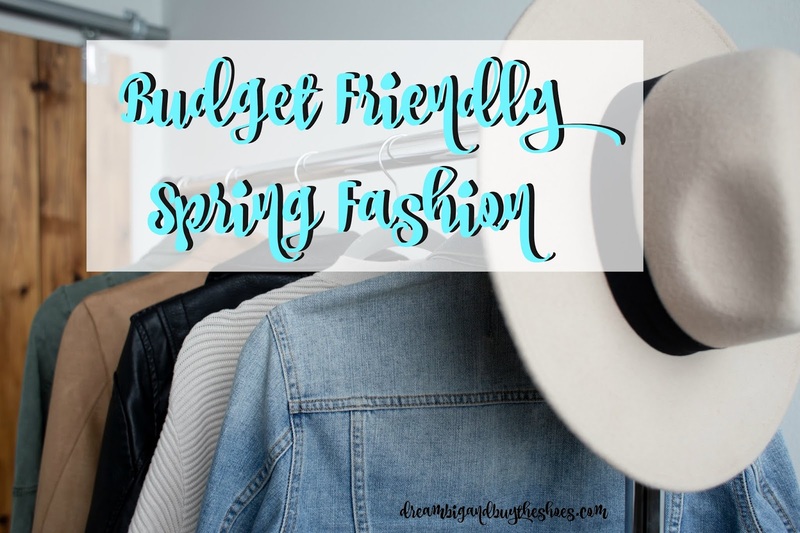 What do you have your eye on for Spring?! !